At a high level, the Directive will hold tech firms responsible for any infringing material posted on their websites without copyright permission. Specifically, the controversy circles around two clauses — Article 11 and Article 17 (previously Article 13). Article 11, referred to as the “Link Tax,” lets publishers charge tech platforms like Google News for using snippets of news stories pulled from other news companies’ publications.4 The controversy revolves around the clause’s ambiguity. For example, in theory, the Directive allows EU member countries to adopt any definition of “snippet” their respective government sees fit. Additionally, Article 11 gives news companies the right to ban links to their articles altogether.5 Google is no stranger to this type of law. In 2014, Spain passed a similar copyright law that forced publishers to charge Google for using news snippets from their publications.6 Google responded by shutting down Google News in Spain, and removing any Spanish publishers from other international sites.7 This in turn ended up harming the smaller Spanish publishers it sought to protect by decreasing internet traffic to those publishers’ websites.8 Now that the EU has passed Article 11, only time will tell what future, if any, awaits for Google News in Europe. Article 17 is arguably even more controversial than Article 11. It essentially ends the “safe harbor” provision that protects online platforms that rely on user-generated content from copyright infringement. Historically, and currently in the United States, online service providers are not required to monitor their users’ posts to prevent copyright infringement. Copyright owners simply send a takedown notice and the online service provider is obligated to remove the infringing post. Article 17 of the Copyright Directive removes those safety nets, forcing technology companies like YouTube to police their platforms and take responsible for material posted without the requisite license.9 Ultimately, online platforms now have an affirmative duty to prevent users from posting infringing material, an insurmountable task. Otherwise, the platform itself could be held liable for its users’ infringement. 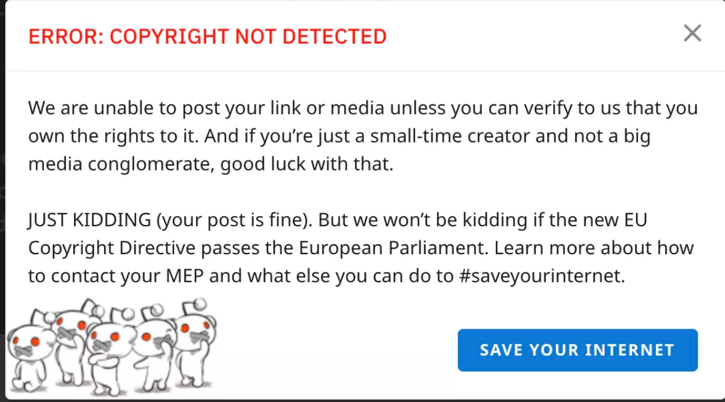 James Vincent, European Wikipedias Have Been Turned Off for the Day to Protest Dangerous Copyright Laws, Verge (March 21, 2019, 6:30 AM), https://www.theverge.com/2019/3/21/18275462/eu-copyright-directive-protest-wikipedia-twitch-pornhub-final-vote. Wikipedia and Reddit were two of many online platforms that voiced their concern with Article 11 and Article 17, and will continue to fight this legislation as it is implemented in the individual member countries. The silver lining for Google, Wikipedia and other tech giants is that EU directives have to be transposed into the national law of each member country. Consequently, it remains to be seen how flexible individual countries’ legislatures will be implementing the law into their own legislations. It’s safe to say lobbying for and against the Copyright Directive will continue as EU member countries begin to draft their own interpretations of the Directive. Regardless, this law illustrates the ever-growing tension between EU internet regulation and Silicon Valley.